The Washington Fish and Wildlife Commission also recently removed bald eagles and peregrine falcons from the state list of “sensitive species,” reflecting their steady recovery since the 1970s when the pesticide DDT was banned under federal law. The birds are a familiar sight in the Mid-Columbia, foraging under dams such as the Wanawish on the Yakima River in the Horn Rapids area. The state has only one breeding colony; the pelicans nest at Badger Island in the Columbia River upstream from McNary Dam near Wallula in the McNary National Wildlife Refuge. Listed as endangered in 1981, the white pelican was one of several species addressed recently by the Washington Fish and Wildlife Commission. The birds are not listed under the federal Endangered Species Act but are protected under the Migratory Bird Treaty Act. The commission removed bald eagles and peregrine falcons from the state’s “sensitive species” list, reflecting their steady recovery since the 1970s when the pesticide DDT was banned. They remain protected by federal law, but the state will no longer designate them for special attention in local land-use planning. The commission reclassified lynx and the marbled murrelets, a small seabird, as endangered because of continuing loss of their habitat. 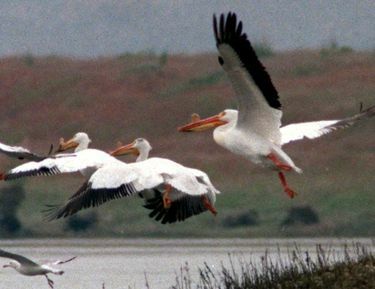 The pelican population remains vulnerable, according to a state Department of Fish and Wildlife report by biologist Derek Stinson. They are sensitive to disturbance, water-level fluctuations and disease and have a history of “boom or bust” productivity. The white pelicans, one of the largest birds in North America, began nesting on Badger Island in 1997. The colony has grown to more than 1,600 breeding pairs. The 3,670 pelicans nesting there account for almost 9 percent of the western U.S. population of the birds. The island is closed to the public and is surrounded by shallow water, providing isolation from boaters.